I have very recently discovered that histamine issues are quite likely to arise when people switch to a low carb diet. The reason being that people who switch to the low carb way of life will tend to introduce many high histamine foods into their diet without realising it. The problem is that a small fraction of us probably lack the enzymes (DAO) needed to manage and eliminate histamine build-up in the body. This isn't a problem for most people, our bodies are designed to produce and eliminate histamine on a daily basis, but for some of us this just isn't happening correctly. Foods that we are encouraged to eat for gut health, like probiotics and fermented foods are extremely high in histamine. As are many fruit and vegetables. Meat and fish produce histamine at a very high rate as the meats age after slaughter, sometimes being stored for weeks before they arrive in our homes. Tinned fish and vegetables are super convenient for those of us who no longer rely on quick sandwiches, but tinned food is aged and high in histamine. And if you're trying to increase your fat intake like I did when trying to reach ketosis, then you're probably going to be snacking on salami, avocados, cheese, nuts, seeds - all of which are high in histamine too! As you can already see, making the switch to low carb is going to be tough for somebody who is histamine intolerant. The problem is that most people are unaware of the condition and many won't know they have an issue with histamine elimination until symptoms appear. The good thing is that you can reduce the histamine levels in your body and help your body to manage histamine better, if you know what to do and are prepared. The month I first started the ketogenic diet in order to reduce my symptoms of ME/CFS was the month I also started itching. 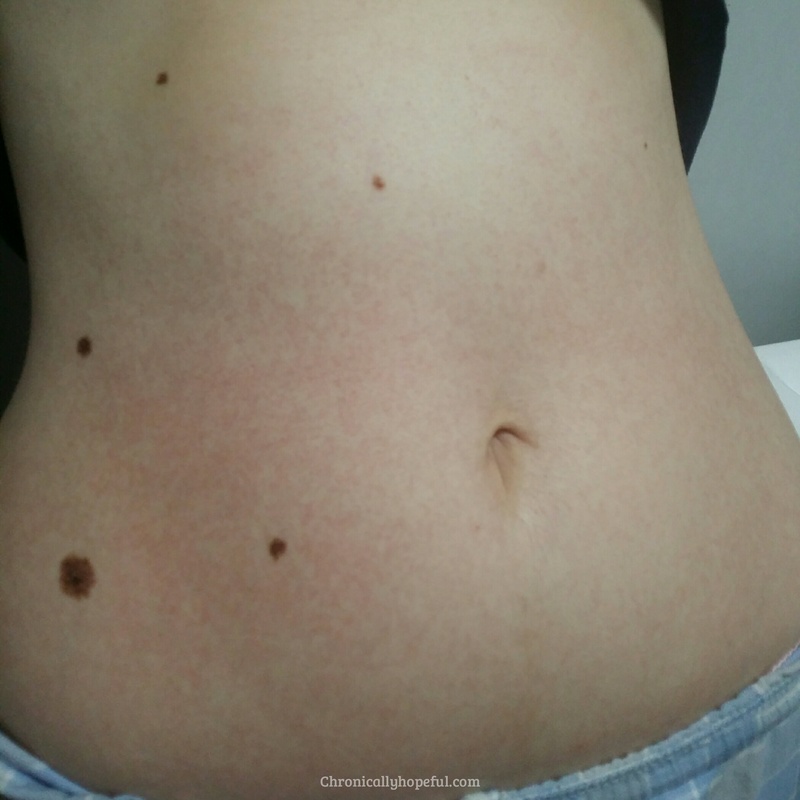 I initially suspected the "keto rash" which I looked into and eventually realised wasn't my problem. 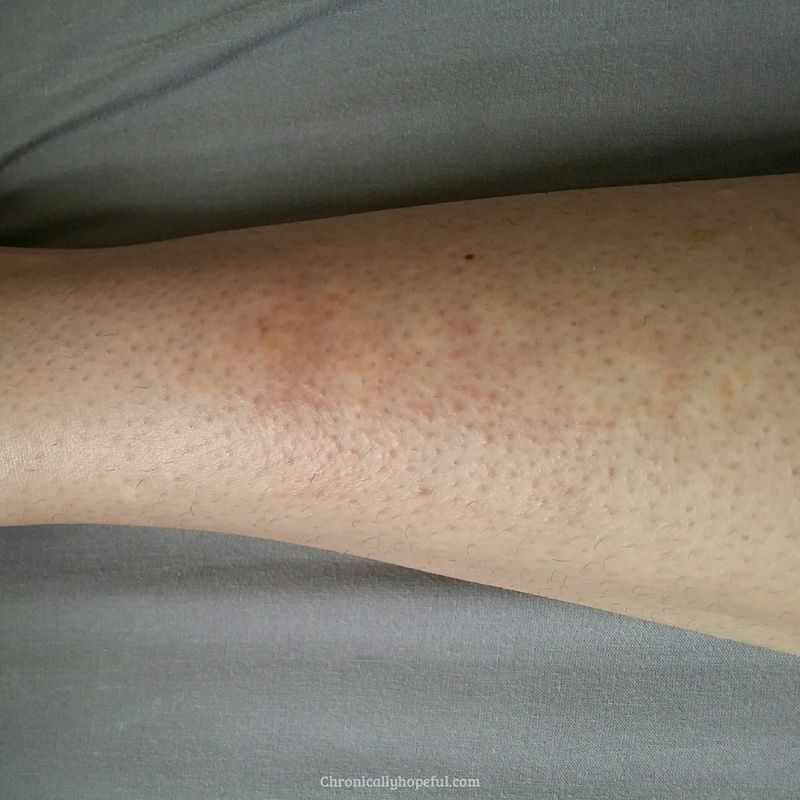 You can read about that investigation and how you can check if you have keto rash here. I went through a few months of itching before somebody mentioned histamine intolerance. I had never heard of it, but they said my symptoms sounded similar to what they had experienced. My journey started with itching, no rashes, no visible signs at all on my skin, just itching all over my body. It gradually increased in intensity and eventually a patch appeared on my one leg. Just a small area of red bumpy skin which doctors told me was eczema. It was super itchy and slowly increased in size over a couple of months despite using cortisone creams and antihistamines prescribed by my doctor. My first big scare came when I was sitting by the window with my legs in the sun and suddenly my whole body started burning up and turning red. Not only that, but I had a burning itch all over my entire body, like every pore had just excreted acid and it was stinging and itching all at once. I stripped down and hopped in a cold bath where I stayed for over an hour before it calmed down. My sister ran to the shops to get me some antihistamines while I was in there. This happened a couple of times over the next few weeks. It seemed to be triggered by heat. Not only would I get these red rashes and the burning itch, but my joints would swell and burn up too. My knees, elbows and knuckles mainly. Ice packs and cold wet towels on my skin help to bring things back to normal. Eventually the hives came on and just didn't go away anymore. I'd wake up with them every day and they'd flare up terribly after every meal. Evenings were bad, the itching was becoming unbearable, it was keeping me up at night. 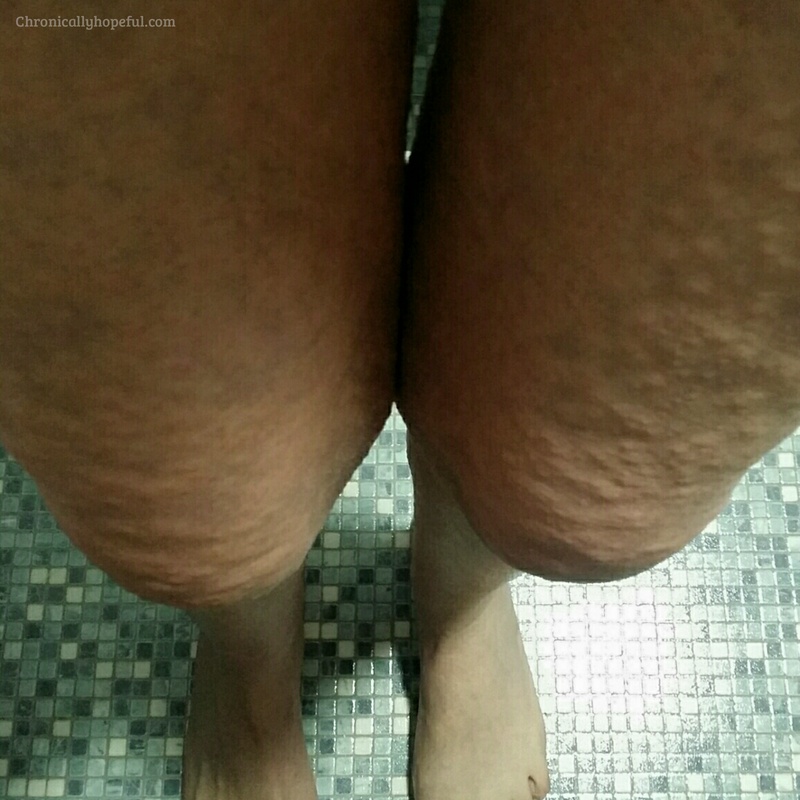 Then the red spots that had started out on my lower legs and then upper arms, spread all over my whole body until only my face was free of these itchy, red bumps. It eventually got so bad that the hives were just constantly flaring for days on end, without any relief. My legs were so bumpy and itchy, I couldn't stop scratching, I couldn't sit still, I couldn't rest. I'd describe the constant itch as mosquito bites on sunburn and then, when the hives flared after a meal, it was like being stabbed by thousands of needles all over my body and the itching became more intense too. I was in tears of frustration on more than one occasion! Not only was the itching driving me to desperation, but I had been scratching so much that my arms were aching and I was exhausted. Having ME/CFS means that any exertion, even scratching myself, causes an increase in all my other symptoms too. This allergic reaction was draining me of the very little energy I had. I'd wake up with cramps in my hands from scratching at night and sometimes simply from itching so much. My legs were bruised all over and it was starting to hurt. I have joined many support groups online and read as much as I can in my condition, a low histamine diet has helped a little initially, but the only thing that has stopped the hives completely has been a combination of fasting and antihistamines. I was initially on Fexofenadine, but when this was no longer making a difference and my condition was only getting worse, my doctor prescribed Ranitidine to take alongside the Fexofenadine. At this point the hives had become constant and the rash had moved onto my face. I had red bumpy skin under my eyes and on my cheeks and the area below my eyes was swollen, burning up and very itchy! I spoke to my doctor again and she substituted the Fexofenadine, giving me Atarax instead. At this point I was hardly functioning anymore, scratching was taking up all my energy and I couldn't even think properly anymore. The itch was consuming and I was utterly exhausted. Somebody suggested fasting for a few days and although I had read that some people flared even more with fasting, I thought it was worth a try if it could possibly help. I initially thought I'd fast for 48 hours, but after 24 hours I was already feeling relief, so I ate a meal and then fasted for another day. After three days of fasting like this, eating only one meal after a 23 hour fast, the hives were gone! I have been eating one meal a day (OMAD) since the first of September, so it's been 18 days now, and although I'm still itching, it is way less intense and I can function again. No sign of hives since, except when I bath. I'm not sure if it's to do with the water temperature or chemicals in the soap or shampoo, or even if its simply because of the extra exertion, but the only time I get hives now is when I bathe. Even the red spots I have all over my body are no longer inflamed, raised and burning, but are calming down and starting to disappear. I have started having a small snack in the evenings, mainly meat and fat,with thyme, no vegetables. So far so good. I also introduced apples and sweet potatoes into my diet when I started the OMAD because they contain things that help to reduce histamine levels in the body. This does mean that I'm likely out of ketosis again, but it's helping my body with the histamine overload, so I'm okay with that. A great way to look at histamine in the body is to imagine your body as a basin. All basins should have an overflow drain so that if the basin gets too full, then it won't overflow because the overflow drain will drain away the excess, keeping the basin level. Our bodies should have an overflow drainage system too, it's called DAO, it's an enzyme that helps to remove histamine from the body. For those of us who have histamine intolerance, chances are our overflow drain (DAO) isn't functioning correctly, or it's missing completely. This means that when our histamine levels get too high, there's no overflow pipe to drain away the excess histamine and our basin just overflows all over the place resulting in itching, hives, rashes, runny nose, sore throat or even stomach ache and IBS! The key is to keep the basin from overflowing. That is why fasting has helped me, by putting food in less frequently, I've given my body time to deal with the histamine it already has. It's as if my basin has a drain block and it's draining super slowly. I can't put anything else in until some of what's already in there drains out. Atarax (Hydroxyzine Hydrochloride), three times a day (upon waking, 6pm, then before bed) and Ranitidine (Ranitidine Hydrochloride), before eating. Fast for at least 16 hours a day. One meal mid day and then a small snack later, if hungry and not flaring. Supplements I take daily: 2000-3000mg of vitamin C, 4000mg of MSM, 5000IU of D3 and Quercitin powder with all my meals. Magnesium flakes or epsom salt in the bath. Eat not only low histamine foods, but also reintroduce anti-histamine and anti-inflammatory foods to equip the body to handle the inflammation and histamine already in my system. Eat no processed, aged, fermented, tinned or pickled food. Eat only fresh food cooked from scratch. Leftovers are frozen after dinner and eaten immediately after reheating. Avoid other common allergens like dairy, grains, nuts, eggs, etc. And inflammatory foods like sugar. Here are some things that have helped me during a histamine reaction. I usually start burning and itching all over, it stings quite a bit and my joints get red and swollen and very hot. Heat aggravates it, so you'll need to cool down the affected areas quickly. Do something relaxing and distracting like watch a calm movie, stress or excitement can trigger histamine release, so you need to stay as calm as possible. Something else you might want to try is Three Tulsi Holy Basil Tea, I found many people recommending it online, I didn't notice any improvements from it personally, but it's worth a shot if you'd like a hot drink and everything else is a trigger. I had a bad reaction from Chamomile and Rooibos wasn't great either. My histamine release was triggered by heat, so that could have something to do with why I couldn't tolerate hot drinks. We are all unique, so you will have to rely on trial and error to find which things your body really doesn't like and which items it doesn't react badly to. I hope my list is a helpful starting point for you. I know I was so lost when I first realised what was happening. It is not easy to find all the necessary information and my doctors were not much help either. They have a great list of histamine levels in foods which you can get from their downloads section. You might also want to look into Mast Cell Activation Disorder (MCAD). Unfortunately this is another condition which is not well understood and quite tricky to manage. There are support groups on Facebook where you will find others who understand. You can share your experience and learn management tips. 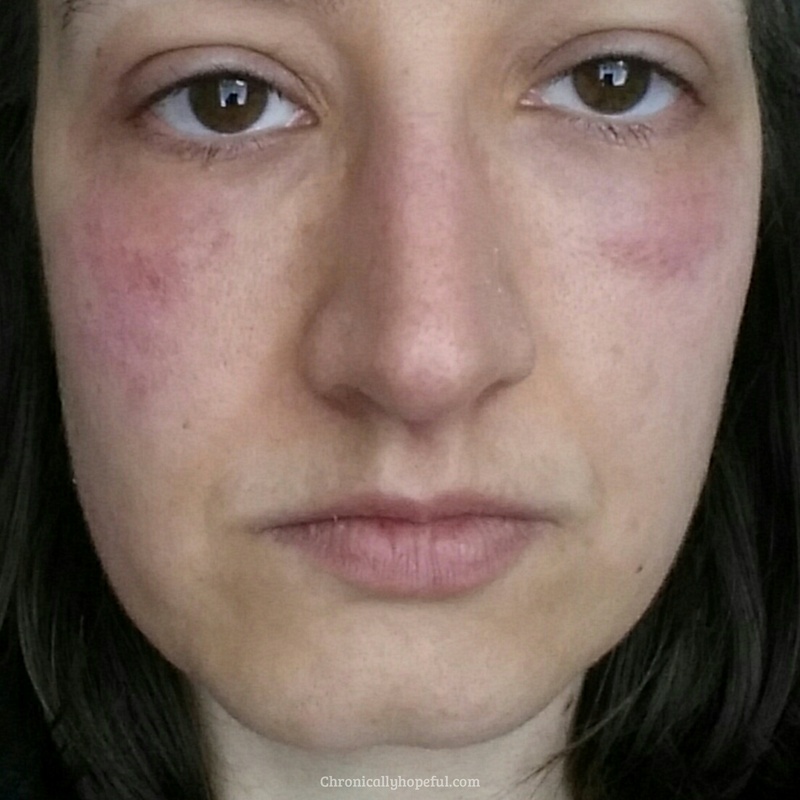 Do you have any tips or tricks that could be helpful to somebody dealing with such allergic reactions? I'd love to hear from you! Please leave a message in the comments below or contact me privately. My itching and hives are under control now. I got rid of the hives by fasting for 24hours a day for three days. This means that every 24 hours I'd have a 1hour window in which I would eat my meals according to the above plan. Within 3 days the hives were gone. I continued for almost 2 weeks eating once a day only. Please keep in mind that I am on the ketogenic diet, which keeps me satiated, drinking a lot of water and electrolytes helps too. After the initial 2 weeks, I started reintroducing a second meal, more of a high fat and protein snack in the evenings as mentioned above, so my fasting window reduced from 24 hours to 16. I did this for most of October, after which my itching had completely gone away and I could start reintroducing some foods again. In small quantities. My itch has only returned, very mildly, since we switched our winter heating on in the house about a week ago. Heat is a trigger for my histamine response, but cold is bad form my chronic pain and muscle shakes caused by ME/CFS, so I'll put up with the slight itch and adjust my meals accordingly to keep it under control. Oh my gosh that’s an awful journey! I’m glad you were able to find the cause and begin to treat it. I got itchy after showers, like insanely itchy, but now I take cooler, quick showers and it helps. I eat only meat, fruit, veggies and nuts and have since ’13 (helps my fibro). The itching came about last year. Thankfully the cooler water seems to help. Hoping you can find a good balance. You’re so strong I think I would have just freaked out. 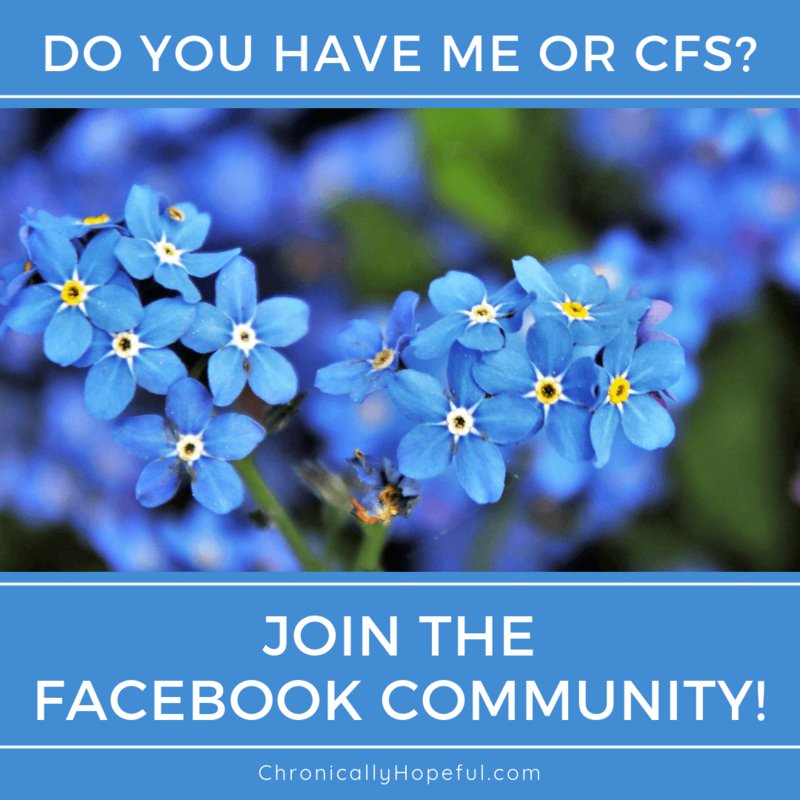 Although the year I was diagnosed with fibro I had inexplicable hives. These bodies just kinda do what they want don’t they.?? So true! Our bodies just seem to do whatever. Just last night I realised that there are really quite a few symptoms that many of us get which just don’t appear on the symptom lists you find online. Quite bizarre things too! Very, very true! Social media has set my mind at ease innumerable times with regard to odd symptoms.??? Wow, I am so sorry you have been struggling to find help for so long! It really is so hard to find information on this. I am glad you have found my story helpful. I hope you have been able to relieve your responses. I’d love to know how you are getting on. The hives’ progression looks super awful!! I get random hives outbreak as well, but usually easily controlled with anti-histamines (I have 4-5 different types at home, depending on situation!). Will re-share this handy guide everywhere! Thanks Sheryl! It was my first time experiencing this last year… 7 months of itching before somebody mentioned this, so I hope to help people before they have to suffer so long. I usually only get seasonal allergies, this was a whole other thing, the usual antihistamines were not touching it. It’s almost 9 months later and I’m still eating low histamine meals, but I can now include some cheaky high histamine items a couple of times a week, spread out, without much reaction if any.